Public concern over the environmental and health risks posed byunderground storage tank (UST) systems has given rise to myriadcodes, standards, and regulations in recent years. In many states,UST owners, operators, contractors, and inspectors must prove thatthey understand how to apply a vast and growing body of technicaland legal specifications to their work. 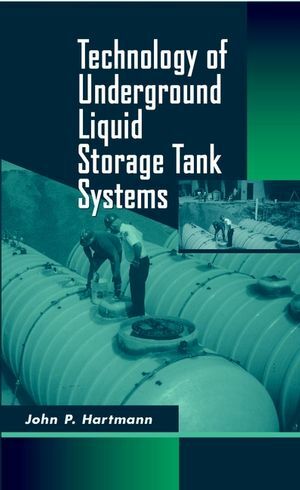 Technology of Underground Liquid Storage Tank Systems is based onJohn Hartmann's celebrated training course at the University ofWisconsin-Madison--the longest-running, most well-attended courseof its kind. It was written for busy engineers, contractors,owner/operators, and inspectors who need to come up to speed onboth the technology and the regulatory requirements involved indesigning, installing, and closing USTs. This complete, practical guide covers all the bases, from siteassessment to damage control, regulatory compliance and legalconsiderations to project management. Drawing upon his 35 years ofexperience as a UST contractor and consultant, as well as theexperience of several other leading experts in the field, Mr.Hartmann provides careful, step-by-step guidance and a gold mine ofpractical advice on how to avoid most technical and legal snagscommonly encountered in building, maintaining, or removing USTs. JOHN P. HARTMANN is President of Hartmann Management Services, Inc., located in Barrington, Illinois. He is a past president of the Petroleum Equipment Institute and served as consultant to PEI in the development of three widely accepted industry standards: USTs, aboveground storage tank systems, and vapor recovery systems. In addition, he serves on three flammable liquid code technical committees of the National Fire Protection Association: tanks and piping, operations, and automotive and marine service stations. Codes, Regulations, and Recommended Practices. Legal Considerations in Tank Installation. Secondary Containment and Overfill/Spill Protection. Site Assessment, Investigation, and Responsibility.